Now even those with gluten allergies or sensitivities can enjoy gluten-free pasta. Unfortunately, you can’t take a regular pasta dough recipe and use gluten-free flour in place of regular flour. Garbanzo bean flour is one gluten-free alternative. 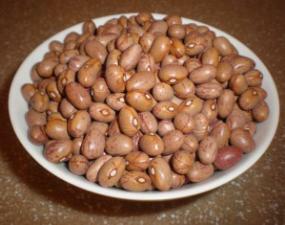 Garbanzo bean flour is made from finely ground chickpeas (garbanzo beans). It makes a pasta dough that is high in protein, low in carbs, and gluten-free. The dough will be drier and not as soft and flexible compared to pasta dough made with wheat but it is equally delicious. 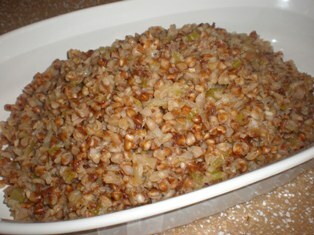 The flavor of garbanzo bean pasta is slightly nutty and the texture is similar to whole wheat pasta. Mound 2 cups of flour on your work surface; scoop out a well in the middle. Crack the eggs into the well along with the salt, olive oil, and 1 tablespoon of water. With your hands or a wooden spoon, work the egg mixture and the flour together till you have a smooth dough, adding just a little more water if necessary. Knead the dough for 5 to 10 minutes, until it is smooth. Shape the dough into a disk, wrap with plastic wrap, and allow to rest for about 30 minutes. Flour your work surface and start to roll out the dough. Flip it occasionally, and flour it as necessary to keep it from sticking. Roll it out into a sheet that is about 1/8-inch thick. If you are using a pasta machine or roller attachment, roll it to about 1/4-inch thick, and then begin to feed it through the pasta machine or rollers. I have found that it is best to stop at a #5 or #6 thickness, as the dough usually begins to break it if gets much thinner. You can now proceed to cut out the dough into the shapes that you prefer. To form string pasta such as linguine or tagliatelle by hand, cut the rolled out dough into strips about 5-inches wide. One at a time, lightly flour each strip, and fold it over into thirds or quarters, creating a small rectangle with three or four layers of pasta. With a sharp knife, cut cleanly through the folded dough crosswise, at 1/4 to 1/2-inch intervals. Shake the cut pieces, opening them into long ribbons of dough. Dust them liberally with flour, gather into a loose nest, and set it on a floured towel or tray. 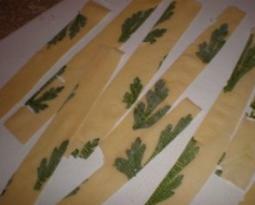 Fold, cut and unfurl all the strips this way, piling the dough ribbons in small nests. Leave uncovered to air-dry at room temperature, until ready to cook (or freeze the nests on the tray until solid, and pack in airtight zip-lock bags). Alternately, you can cut the dough by feeding it through the cutters on a pasta machine. 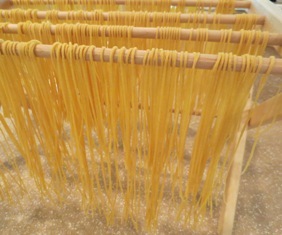 Follow the above method for drying or use a pasta drying rack. 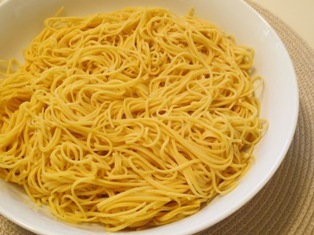 To cook, put the pasta in a large pot of boiling salted water. Cooking time will vary depending on how thin your pasta is, but it should be ready in less than 2 minutes. When the pasta rises to the surface, take a piece and taste it. You should be able to bite into it without the pasta falling apart. Watch it closely, as garbanzo bean pasta can go from al dente to a disintegrating mess in a few seconds.